By now we know that parents have a wide range of challenging behaviors to manage as their children grow and develop. Over the past few weeks, we’ve discussed that these behaviors can be the result of several different factors, including emotions, developmental stage, and the child’s environment. Now that we understand this in theory, let’s talk a little more about how to look at the situation and decode what’s going on in the moment. If your child is in the middle of a full-on meltdown, remember to respond, not react. It’s important to be mindful of how we manage the situation. This can take some getting used to and can require a lot of patience as you learn your child’s triggers and habits. When does the behavior usually take place? Are there any common factors? For example, you child may be more prone to meltdown when he or she is hungry or tired. What usually happens right before and right after the behavior? What emotion is your child feeling when he or she acts this way? What might they be struggling with? For example, is your toddler refusing to lay down for bedtime because he or she is afraid of the dark? What is your response to the behavior? How does your child react to that response? How could you respond better or more consistently to the behavior? Challenging behavior isn’t random and probably isn’t coming out of the blue. It can escalate quickly, but it usually doesn’t happen for no reason. According to the Challenging Behavior Foundation, challenging behaviors come in stages depicted on the curve below. When your child is in the green “proactive” he or she is calm and relaxed. During this phase you are able to engage with your child in a positive way. When your child is in this phase, consider what contributes to their peacefulness. What factors help them to feel calm and relaxed? This may be helpful as your child enters the next phase, as a way to bring them back to center. Don’t underestimate the power of creating a distraction when your child begins to get upset! The amber “active” phase takes place when your child starts to feel stressed. In this phase, he or she may begin to challenge you. This is a good time to provide supports in order to try to bring your child back to “green.” For example, if you’ve noticed that your child is most calm in a quiet environment, try to reduce noise when your child begins to get agitated. 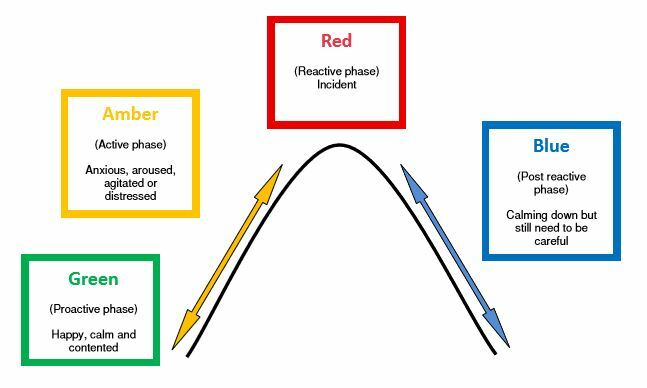 Challenging behavior takes place in the red “reactive” phase. In the previous “amber” phase, they begin to feel the emotion that causes them to act out. In this phase, the actual behavior occurs. 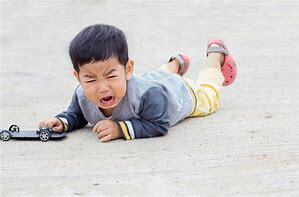 Imagine a toddler throwing his or her food on the ground after being told to eat one more bite. Lastly, your child will enter the blue “post reactive” phase. This is when the difficult behavior is over and the child begins to relax and return to their calm state. Using these stages as a guide, you can better identify your child’s needs as their behavior and emotions escalate. In each stage, you can learn strategies or tricks to help bring your child back down to their calm, happy state. Some days, you may be able to keep your child from reaching the red stage by being alert and addressing their needs while they are still in the amber stage. Some days, you may not and that’s ok! If you believe that your child’s behavior is outside of what may be normal for his or her age group or if you are having trouble managing the behavior, don’t hesitate to ask for help. Ask another parent for advice or seek out a professional’s opinion. Parents don’t have all of the answers, and that’s ok! Take a look at this article to learn more about some key principles to help you shape and manage your child’s behavior. Handle tantrums like a boss! Here are three quick tips to help your child calm down.